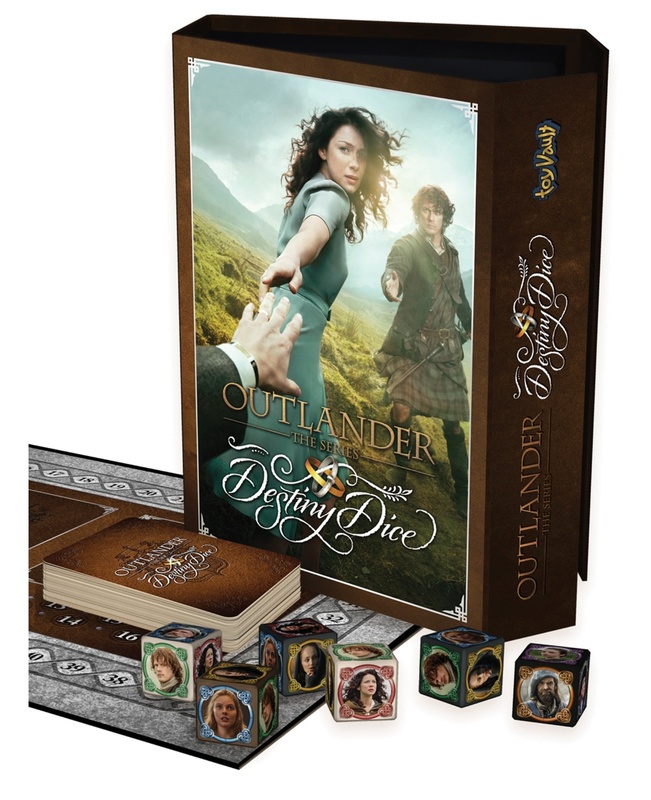 Outlander: Destiny Dice supports 2-4 players and game-play typically takes 20-30 minutes. Each player rolls the 6 custom dice. The goal is to roll Jamie and Claire characters. Dark characters, like Black Jack Randall and Laoghaire MacKenzie, can ruin great rolls when they appear, while helpful characters like Jenny or Dougal, can save poor rolls. Players can alter destiny through action cards which allow players to re-roll dice or modify their roll. After each player has rolled, players compare rolls. The best rolls advance their players forward on the destiny track, bringing Jamie and Claire closer together. The first player to get Jamie and Claire together wins the game. The Outlander television series is adapted from Diana Galbadon’s New York Times best-selling Outlander book series. Produced by Sony Pictures Television and filmed on location in Scotland, Outlander follows the story of Claire Randall, a married combat nurse from 1945 who is mysteriously swept back in time to 1743 and thrown by circumstances beyond her control into the arms of Jamie Fraser, a chivalrous and romantic young Scottish warrior.